Magic number seven. 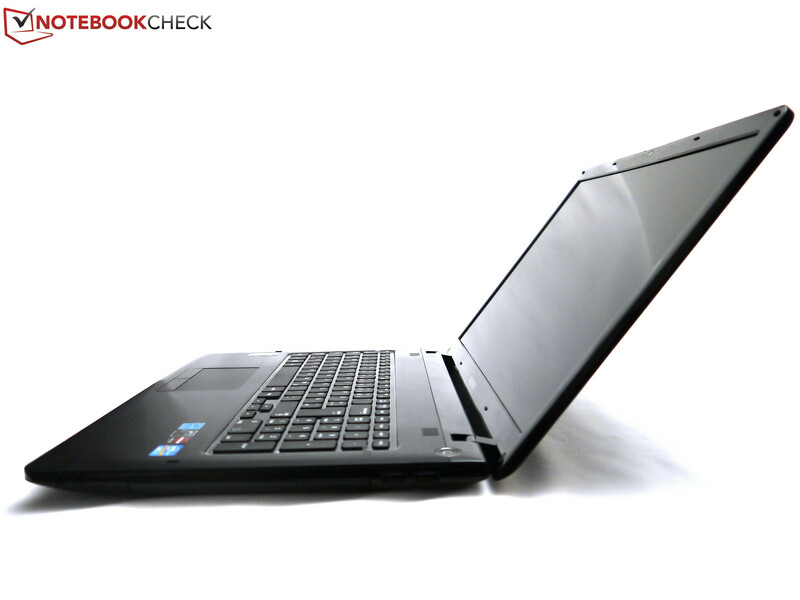 An Intel i7 processor, a 7670 AMD graphics card and a 750 GB hard drive all packed into a 17.3-inch notebook. It's easy to see Samsung is hot on the number seven. But are we hot on the notebook too? 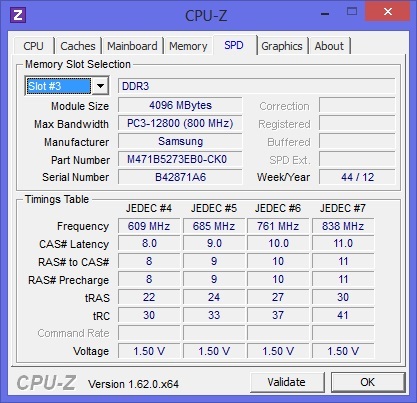 After our review of the Samsung 355E7C with an AMD processor, now we are putting the Intel version through rigorous testing. Visually these notebooks are no different, but in place of the 355E7C's dual GPU solution, Samsung puts an extremely powerful CPU in the form of an i7 Quad-Core processor in the 350E7C. 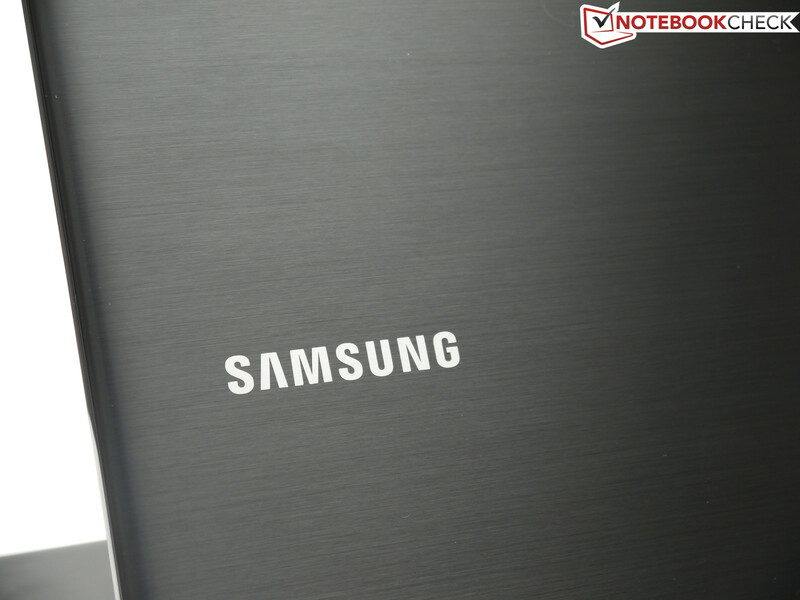 We will not go into an extensive review of the input devices, connectivity, case or speakers here, since we fully explored those items in our recent review of the Samsung 355E7C. 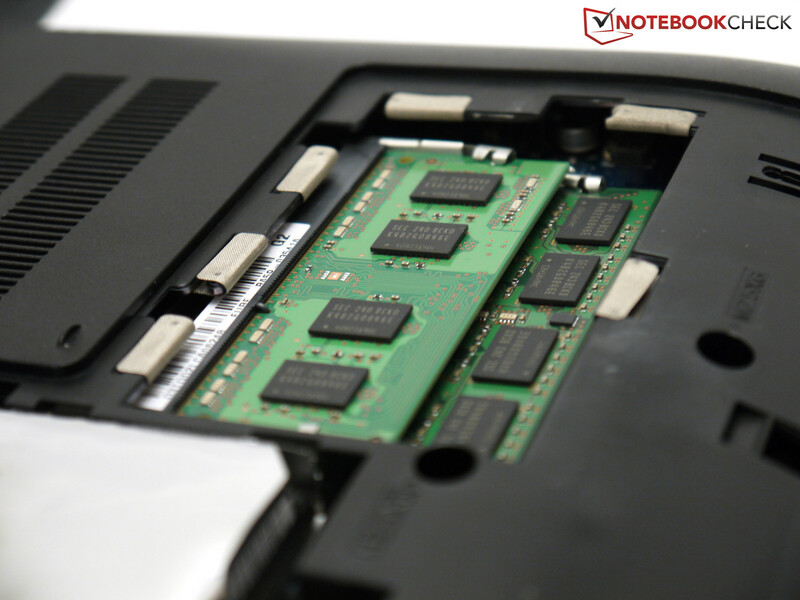 For information on those aspects of the notebook we refer you to the review of the AMD version, as we will only address the differences between the two here. 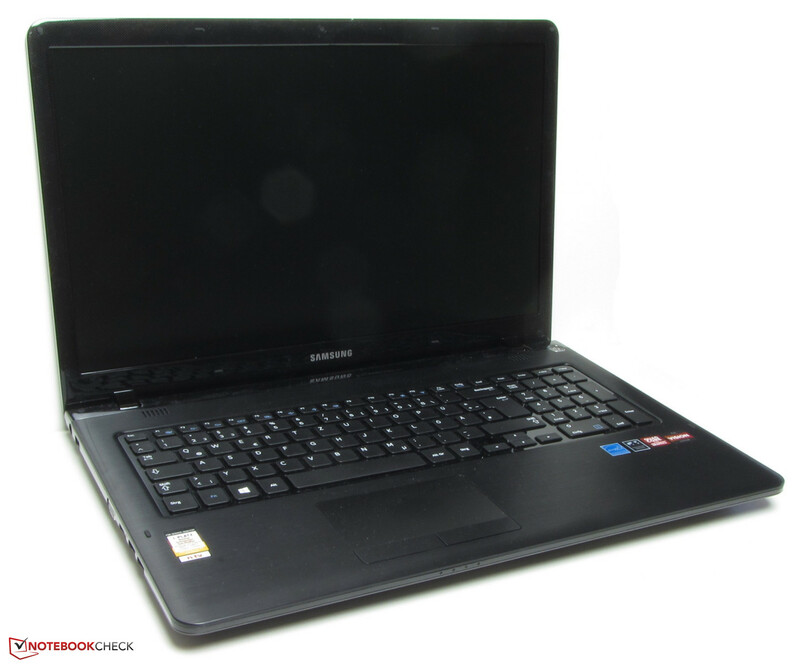 17-inch multimedia notebooks are certainly no rarity, even under a price limit of 800 Euros (~$1049), which means the Samsung 350E7C faces a huge breadth of competition. However, if you are looking for an anti-reflective display, the selection suddenly thins out considerably. The main competitors here are the Dell Inspiron 17R SE and the Acer Aspire V3-771G – both built with a Full HD display. Like in our review device's sister model, the 355E7C, the display comes from AU Optronics and is classified as the B173RW01 V4. The technology behind it is a cost-effective anti-reflective TN panel. 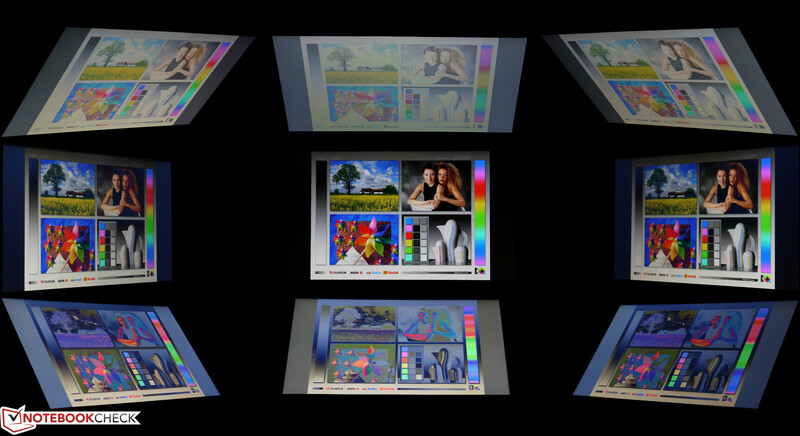 1600x900 pixels (WXGA++) are spread over a 17.3-inch display diagonal, which corresponds exactly to the 16:9 format. Both the format and resolution are common at this display size, though the Dell Inspiron 17R SE and Acer Aspire V3-771G represent competitors in the same price class with Full HD resolution (1920x1080 pixels). A higher resolution display for the Samsung E350E7C/355E7C is not available. We measured the maximum brightness in the upper left corner at 212 cd/m². On average, our measurements came to 200 cd/m², which resulted in a good illumination level of 88%. In battery mode, the screen darkened about 20% to 152 cd/m². The 17R SE managed 100 cd/m² more here. At 219:1 the contrast is not very convincing, and the high black value of 0.9 cd/m² is not particularly appealing either. Subjectively the colors look gray and dreary. The panel quality differs greatly between devices, for example between our review device and the 355E7C; both the contrast and luminosity are higher on the 355E7C. With a contrast measurement of 726:1, here too Dell's 17R SE takes the lead. 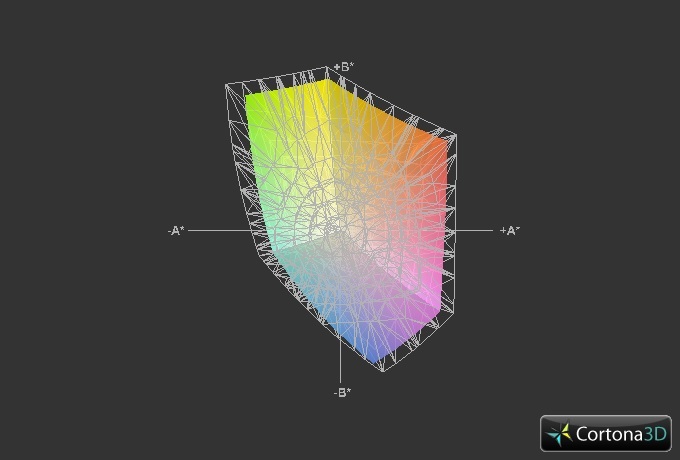 The Samsung 350E7C cannot display the sRGB nor even the AdobeRGB color space, despite the fact that the color space is marginally larger than that of its sister model 355E7C. 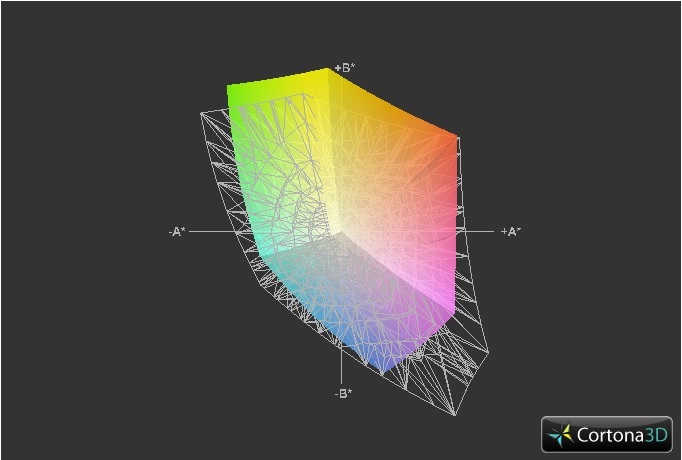 However, coverage of these color spaces is only relevant for professional graphic designers and photographers. 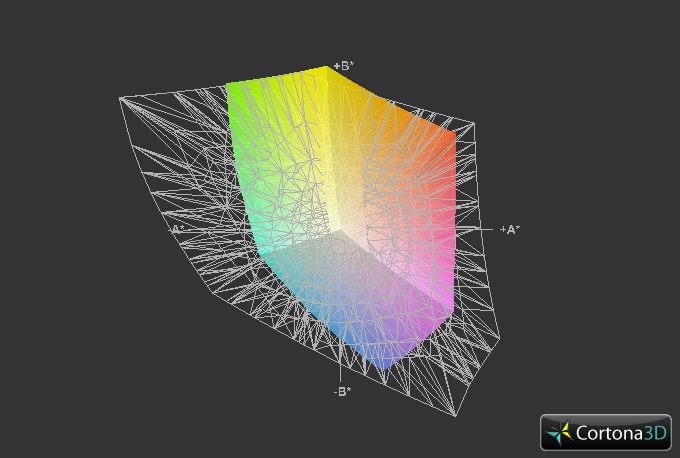 With the notebook in its factory settings, we performed a color analysis with the i1 Pro 2 spectrophotometer and the CalMAN 5 software. Again, the display quality differed from that of the sister model, but this time in favor of the 350E7C. For the grayscale display we measured a Delta E (2000) of an average of 10.5 (355E7C: 14.4). A trained eye can already perceive deviations from the ideal at a Delta E of three. On a positive note, the gamma value of 2.14 (average) is not far from the standard (2.2). But the color fidelity turned out to be another con, with the colors blue, cyan and magenta at Delta E values of 14, 10, and 11, respectively. These were also the most noticeable colors when it came to color saturation. Additionally, at 8139 Kelvin the white point (normal: 6500 K) was clearly shifted into the blue area. The display's blue cast is unmistakable even to the naked eye and causes the picture to appear very cool. Due to the notebook's limited display brightness and weak contrast, even with its matte display outdoor use in full sunshine is problematic. There are no bothersome reflections, but the content of the screen is still hard to read. The sister model does better here, thanks to its higher contrast and brightness. Indoors and under a cloudy sky we did not notice any limitations with either model. 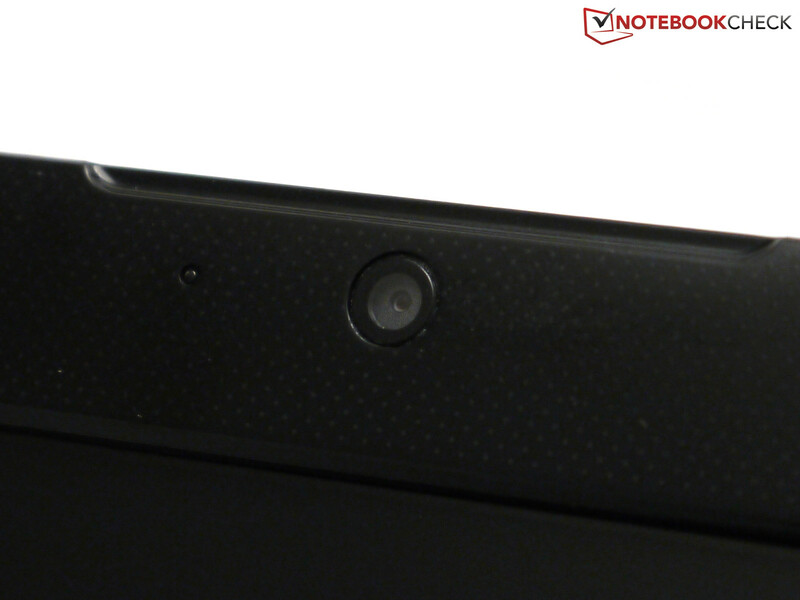 In terms of viewing angles there were no significant differences between our review device and the 355E7C. As is typically true of TN panels, only with horizontal viewing angle adjustments did the picture remain largely unchanged. With vertical adjustments however, image changes occurred much more quickly, either in the form of inversion or overexposure, depending on the angle. Much better viewing angle stability can only be found in IPS or PLS panels and those are generally only to be expected in higher-priced notebooks. One exception here is the 15.6-inch Acer V3-571G with a Full HD and IPS display. The Samsung Series 3 350E7C is available in numerous variations. It kicks off with the 350E7C at a quite reasonable starting price of 470 Euros (~$616). For that amount the buyer receives an Intel Pentium B970 processor, 4 GB RAM and 500 GB of storage space. The user will have to go without a dedicated AMD Radeon HD 7670M graphics card, however. However, this can be purchased for just 30 Euros (~$39) more, in a variation that includes a Pentium B980 and 6 GB RAM as well. Samsung affixes the same asking price to the 355E7C with an AMD A4-4300M processor. If you want a little higher CPU performance, for an additional 50 Euros (~$66) the similarly outfitted 350E7C-S0HDE steps onto the field. An Intel Core i3-3110M is at work in that model. The i5-3210M is available for 650 Euros (~$852) and a model with the i7-3610QM quad-core processor can be purchased for under 700 Euros (~$918). The latter is at work in our review model, along with 6 GB DDR3 RAM and 1 GB of graphics memory at the command of the HD 7670M. 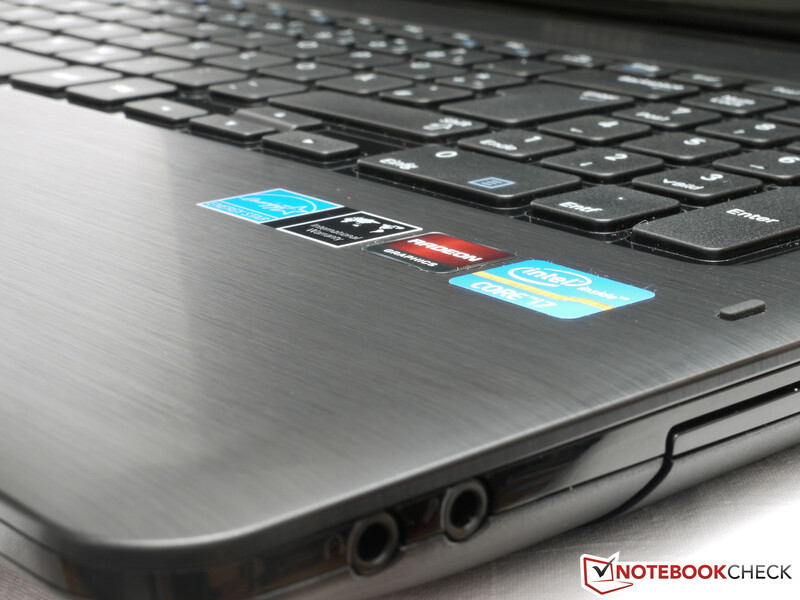 The i7-3610QM is no longer a dark horse for us, since it is very common in gaming and multimedia notebooks. The quad-core processor's performance capabilities easily suffice for office applications, Internet surfing, 3D games and HD video editing. 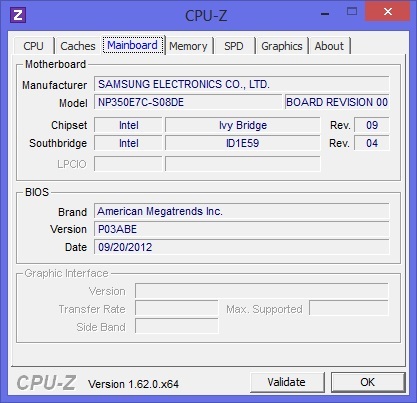 Details regarding this CPU are summarized in this separate article; we direct you to that page for more information. First, we determined the CPU's performance capabilities with the Cinebench R11.5 benchmark. With 6.42 points in the multi-core benchmark, the CPU comes in a good distance ahead of the sister model 355E7C's AMD APU. Even the other competitors with Intel Core i5 processors cannot keep up with those numbers. 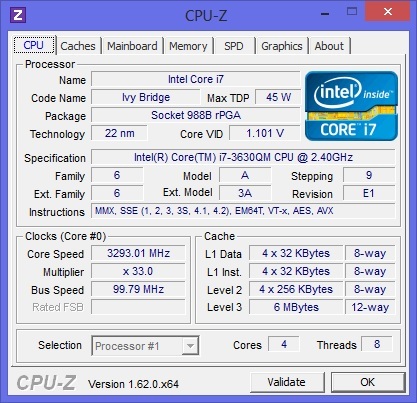 The performance proves to be on par with that of recently tested i7-3610QM processors. During the multithread test, the four cores measured a clock frequency of 3.2 GHz each; however, in the single thread test the clock rate of a single core rose to 3.3 GHz. In battery mode, the CPU only reached a clock frequency of 2.4 GHz, so 100 MHz over the standard clock rate. The logical consequence of this is a 25% drop of the end result to 4.82 points in the multi-thread test. 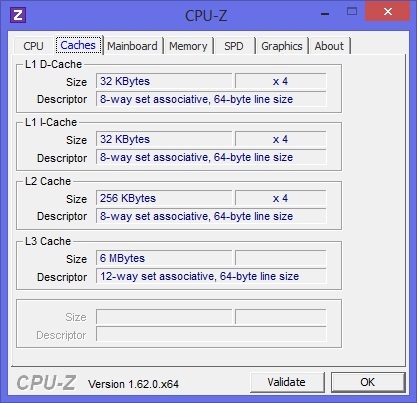 The PCMark 7 benchmark reflects the computer's performance abilities in pre-defined application scenarios, for example image editing and surfing the Internet. The processor, main memory and hard drive are tested here. A resultant 2467 points is a very respectable score, and few competing models come out stronger. Computation is performed quickly, but application launches take time. 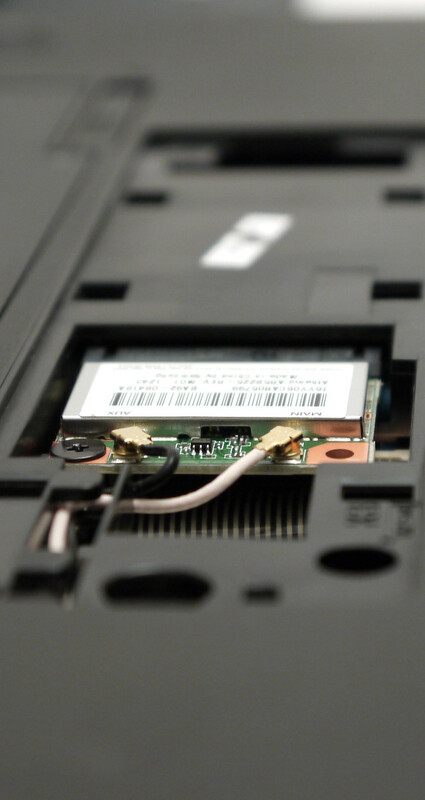 The weakest member of the chain is clearly the hard drive, which we will inspect more closely in the next section. For the storage of user data, Samsung installs a Hitachi Travelstar hard drive with a gross capacity of 750 GB. Due to its rotation speed of 5400 revolutions per minute, no miracle can be expected of this component. The average transfer rate as measured by HD Tune is 66.8 MB/s - not an outstanding result. At 21.1 milliseconds the access time is also very slow. 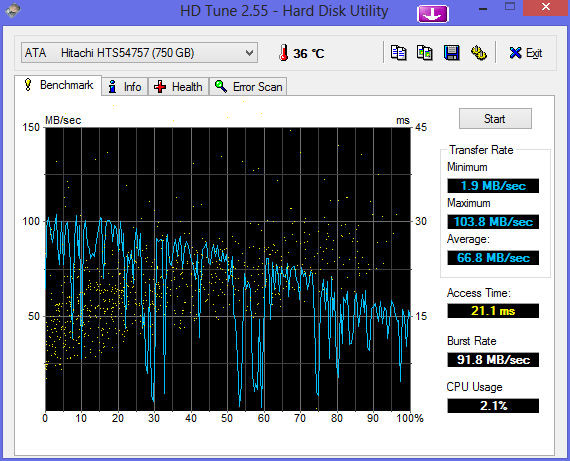 With those scores the HDD is one of the lower ranking hard drives we have tested so far. With considerably shorter access times and higher 4K values, an SSD would ensure a strong increase in performance, since application start-up and boot times would be drastically shorter. Samsung relies on the Radeon HD 7670M from AMD for the computation of numerous polygons. This is a mid-class graphics card often built into 15.6-inch notebooks. The GPU has 1024 MB DDR3 memory at its command, none of which are borrowed from the six GB of working memory. If the full GPU performance is not needed, to spare energy the machine can also switch to using the Intel HD Graphics 4000 integrated into the CPU. But the Enduro graphics switching has to be manually set to high performance for each game, otherwise all games will run on the Intel GPU. In the synthetic benchmark 3DMark 11 our test system lies between Nvidia's GT 635M and GT 640M. The new Radeon HD 8730M comes in ahead of our test system. 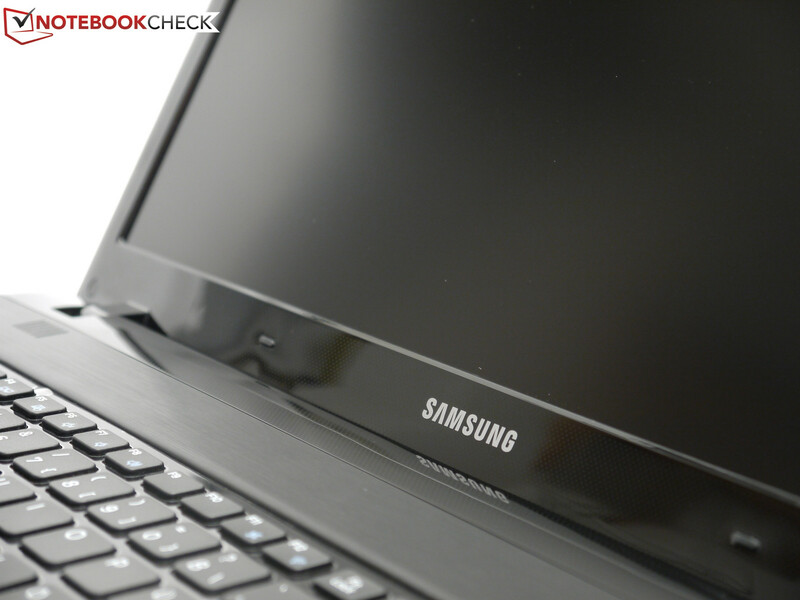 Using two graphics cards working in parallel, the Samsung notebook's AMD counterpart obtains a considerable lead of 32%. 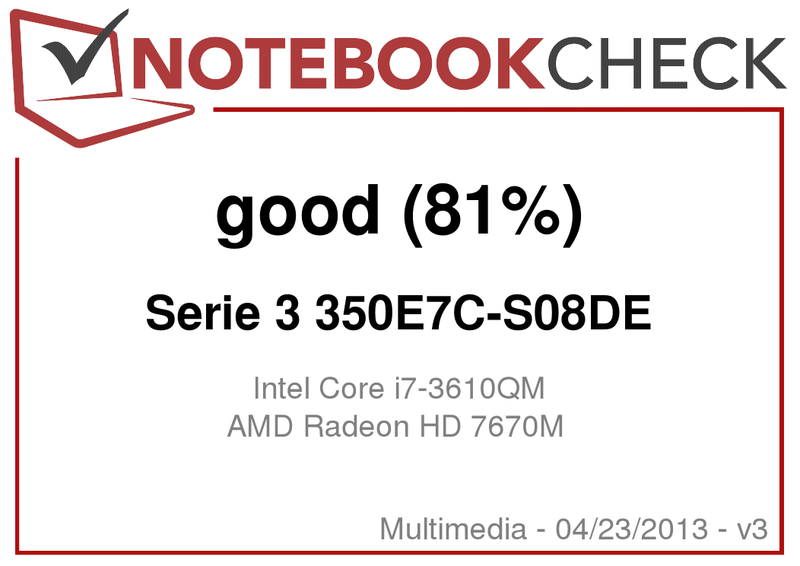 The Dell Inspiron 17R SE and the GT 650M graphics card do even better (+88%). A system equipped with an Intel Pentium B980 processor and an HD 7670M graphics card also comes out with 1233 points. The CPU is only a limiting factor when playing CPU-intensive games, but for many current titles, even the 350E7C's B980 entry-level processor is sufficient. 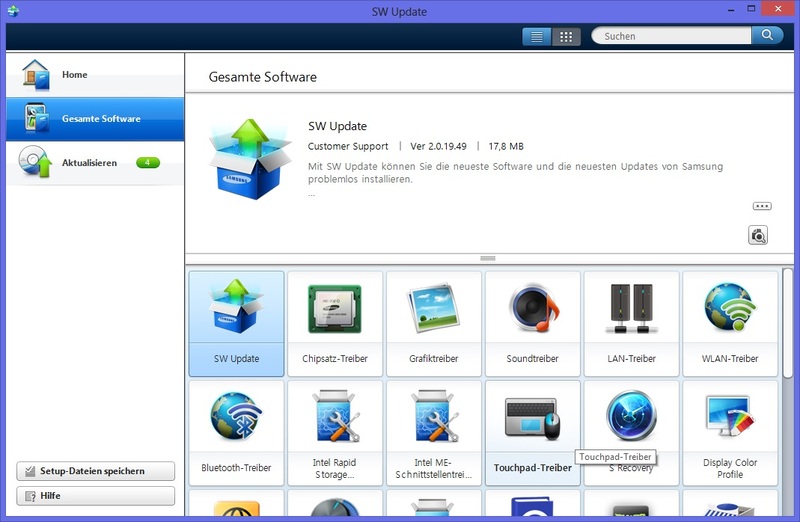 Alternatively, one can turn to the Dual Graphics solution with a combined HD 7670M and HD 7640G (Samsung 355E7C). We let the 3DMark 11 benchmark run again in battery mode and came to exactly 1229 points once again, which means the notebook retains full graphics performance unplugged as well. However, due to the CPU's lower turbo clocking rate in battery mode the frame rate could slip for some games. Current games are generally playable on the Samsung 350E7C in medium detail without jerking. For the native resolution (1600x900 pixels), however, the graphics performance is only sufficient for older titles. Where the 355E7C's dual graphics team was the clear leader in the synthetic benchmark, the tide turns when it comes to gaming performance. At low detail the system with the Intel processor usually dominated, which means that CPU-heavy games profit from the 350E7C's quick quad-core processor. The 355E7C's Dual Graphics solution only has a clear advantage in the game Anno 2070. The characteristics of the fan in the 350E7C can generally be described as good. Our only criticism is that Samsung could have come up with a better solution for fan noise under minimal load. Now and again the fan does turn off completely, but this is rare and only lasts a short time. In idle mode, we measured a clearly audible 34.6 dB(A). At 34.2 dB(A) the hard drive is no quiet component either and sounds more like a quickly rotating 7200 rpm hard drive than one at 5400. Nevertheless, at a maximum volume of 36.6 dB(A), with both the CPU and the GPU under 100% full load, the system is hardly any louder. During gaming too (tested: 3DMark 06) at 36.4 dB(A) the noise development remains within reasonable limits. At 36.8 dB(A) the DVD drive is the only component we consider too loud and bothersome for a movie night. The fan controls can be tweaked using the quiet mode in the Samsung settings, which lowers the clocking frequency of the processor to 1.2 GHz per core. In idle mode, the fan then remains quieter and shuts off for longer periods. However, under full load or during gaming this mode does little to reduce noise emission and it leads to a substantial reduction in performance. 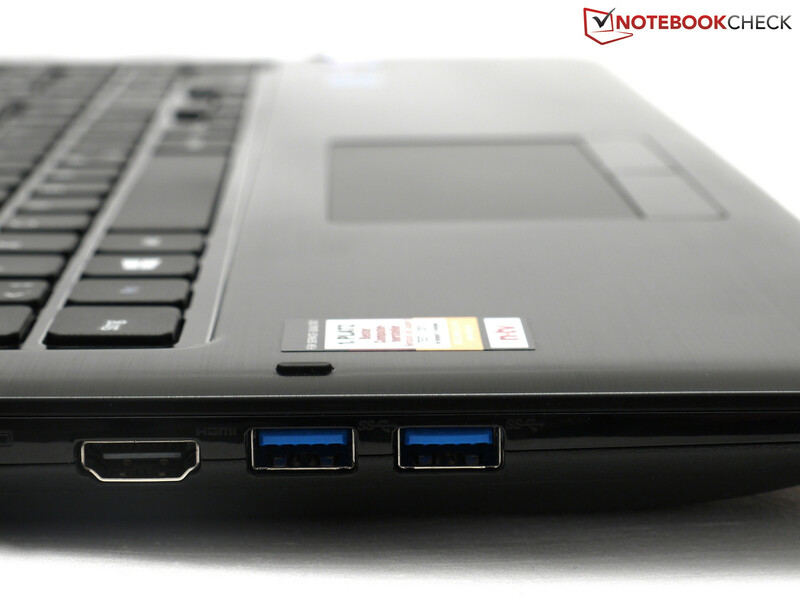 If you were to only look at the notebook's temperatures, you would guess that the 350E7C has a ULV-CPU with integrated graphics rather than its i7 Quad Core processor and game-capable graphics card. The temperatures in idle mode are fully acceptable, with a maximum of 33°C (~91°F) on the underside and 31°C (~88°F) on the top. With the system under full load (FurMark + Prime95) we measured a maximum of 36°C (~97°F) on the underside. The touchpad and palm rest remain quite cool for right-handed users; left-handed users will feel the palm rest grow slightly warmer, though not enough to be uncomfortable. Due to the moderate temperatures, it would be no problem to use the device in your lap. Since the surfaces – even during stress – don't grow especially warm, it's no wonder that the component temperatures all remain in the green. The combination of FurMark and Prime95 only warm the Radeon 7670M graphics card to a maximum of 63°C (~145°F). With a maximum temperature of 93°C (~199°F), the CPU is clearly closer to the critical area, but this doesn't lead to throttling. However, the turbo frequency was set to 2.5 GHz at the beginning of the test – after two hours under load the CPU ran with a clocking frequency of 2.4 GHz, just over the standard clocking rate. 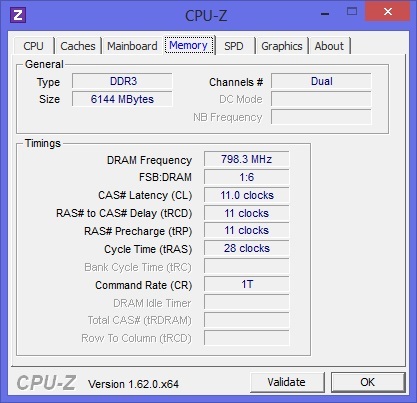 During the next test with Cinebench R11.5 the CPU could reach the maximum clocking frequency and score once again, so in practical application scenarios users have no need to anticipate performance deficits. 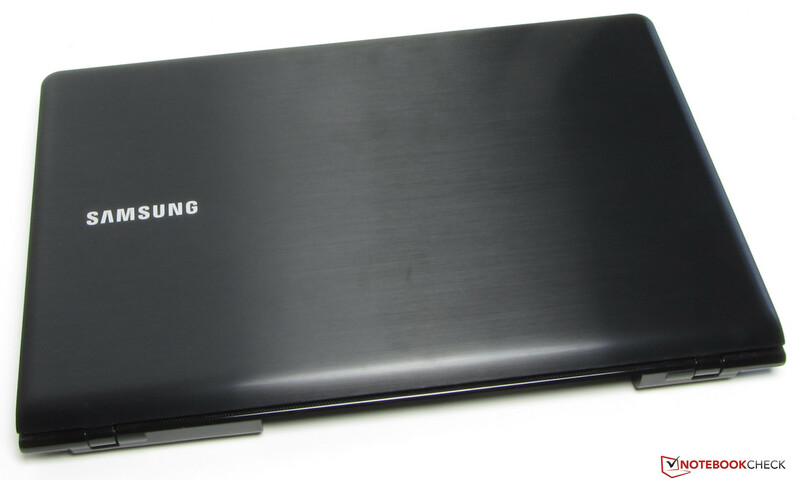 For a 17-inch notebook, the Samsung 350E7C is incredibly frugal with its energy. In idle mode, we measured 8 to 15.9 Watts. At 11.6-17.1 Watts the AMD counterpart 355E7C definitely grants itself more. The Dell Inspiron 17R SE comes out with about the same numbers here (8.8-15.9 Watts). 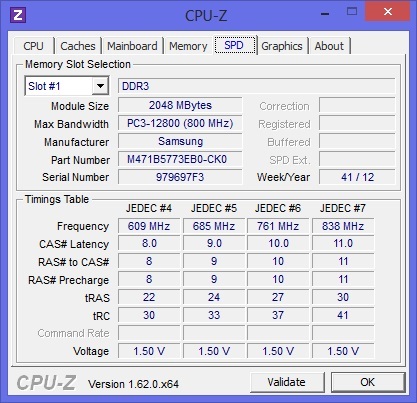 With 41 Watts in the 3DMark benchmark, the Samsung 350E7C needs about half of what the 17R SE guzzles up, though in the 3DMark test the Samsung device also lies about 48% behind in terms of performance. Under full load, as well the Samsung notebook proves, with 50 Watts, to be extremely thrifty. 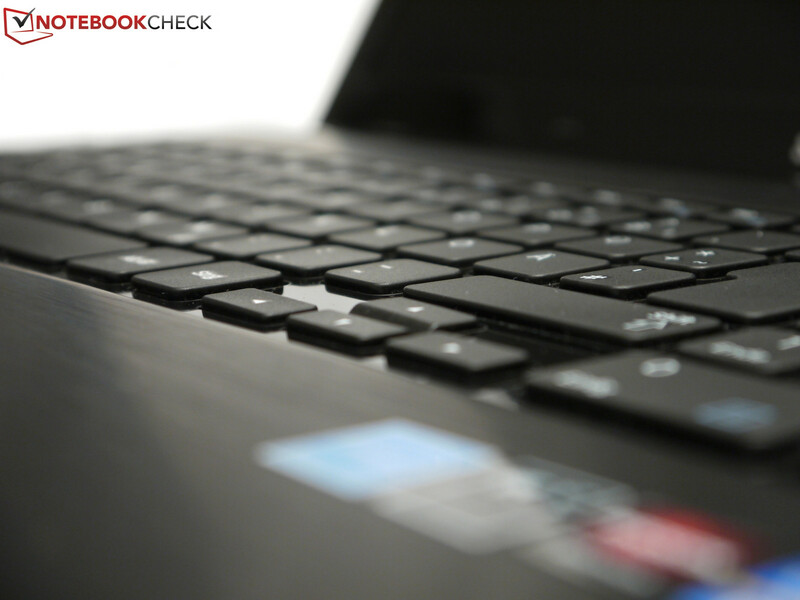 Even the Dell Inspiron 17R with its ULV processor cannot keep up. With 90 Watts the power supply is more than adequately dimensioned. Despite the 350E7C's considerably higher CPU performance, its battery run times are thoroughly superior to those of its AMD counterpart. At minimum brightness, deactivated wireless modules and under very low load - generated by the Battery Eater Reader's Test - the 350E7C manages quite a good run time: 6 hours and 17 minutes. The AMD sister model runs out of steam almost 2 hours earlier. Run times while surfing over wireless Internet or playing a DVD also prove to differ by about 30 minutes in favor of the Intel processor. Only at maximum brightness and under load generated by the Battery Eater Classic Test do the two systems align at about an hour of battery life. It takes 1.5 hours to charge the 48 Wh battery back to 100% with the system turned on. 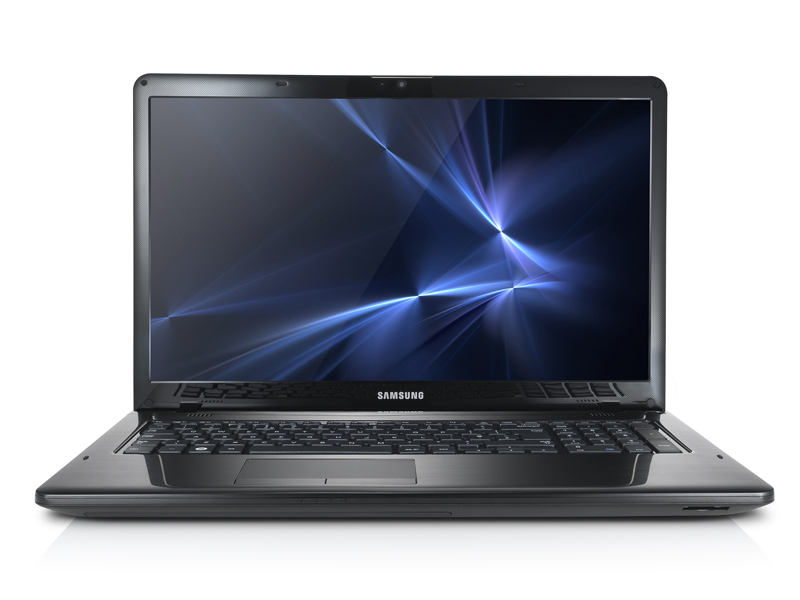 Even the Samsung 350E7C isn't the perfect 17.3-inch multimedia device. 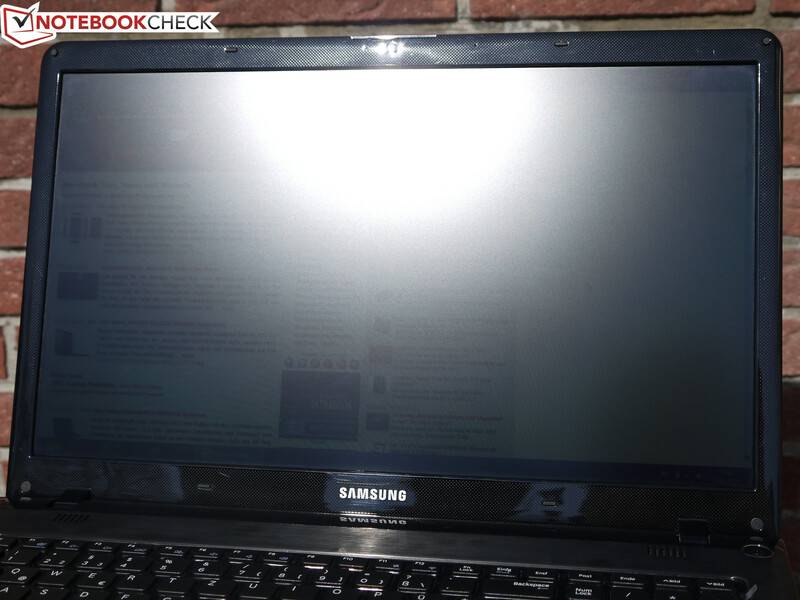 For example, during testing the notebook proved to have a poor contrast display with only moderate brightness. Another negative was the slow hard drive that markedly delayed application launches. However, for a current price of 700 Euros (~$918), the powerful i7 processor and good gaming performance definitely impressed us. Even greater gaming performance is available with the Acer Aspire V3-771G and the Dell Inspiron 17R SE, both of which are equipped with more powerful GeForce GT 650Ms. These two models also trump our review device with their Full HD displays and better case stability, though they cost about 100 Euros (~$131) more. If you need something less expensive, the sister model 355E7C with an AMD processor and Dual Graphics solution is available for an asking price of 600 Euros (~$787), but it offers considerably less CPU performance. If your attention is focused on the latter, we advise you to take a closer look at the HP Pavilion g7 and Lenovo G780 notebooks. The arrow keys are a little small. 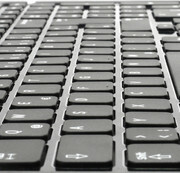 The stereo speakers are located above the keyboard. 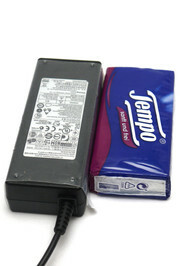 The battery is charged with a 90 watt power supply. Both memory banks are already occupied. Always make sure you have the latest drivers. 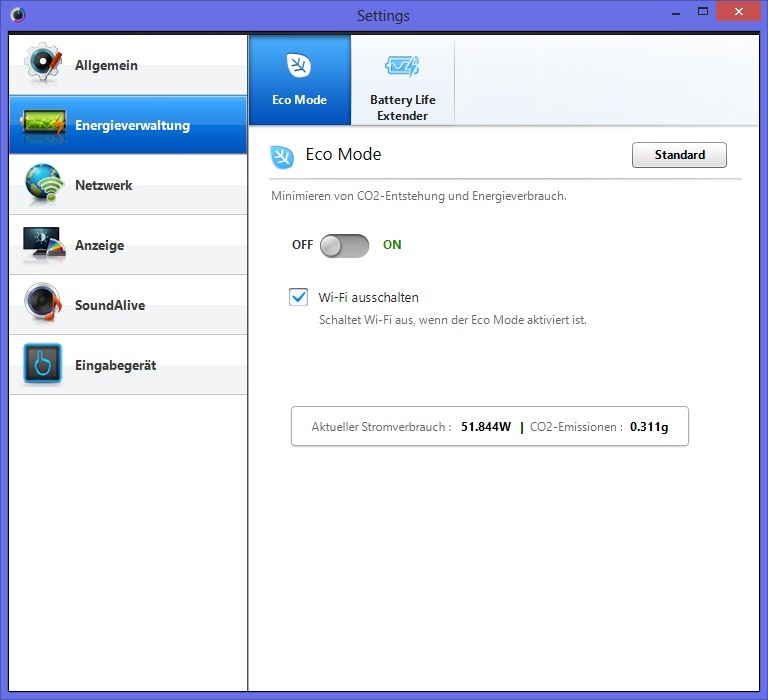 The eco mode reduces power usage. ...but the whole notebook is actually made of plastic. This look dominates the inside as well. Elements with a black finish are mandatory of course. The screen doesn't open beyond a relatively small angle. But running a video chat isn't a problem. 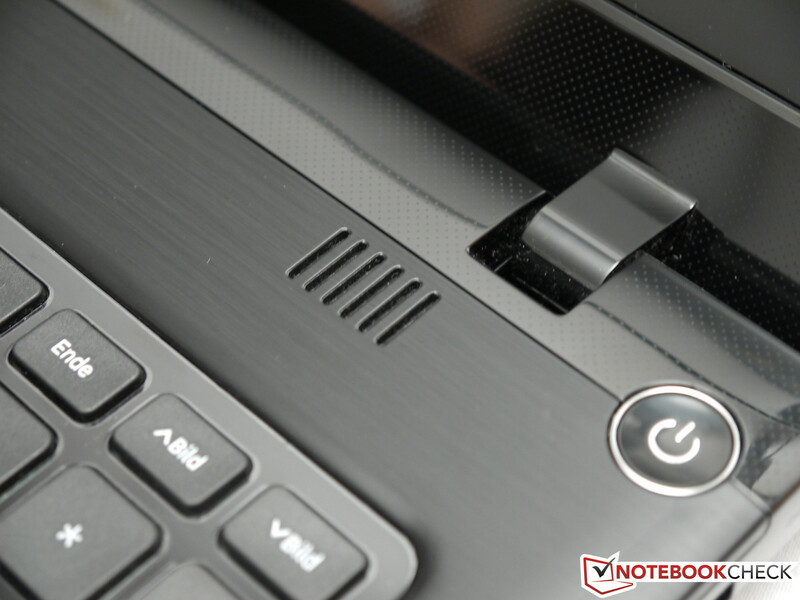 Samsung treats the notebook to two USB 3.0 ports. 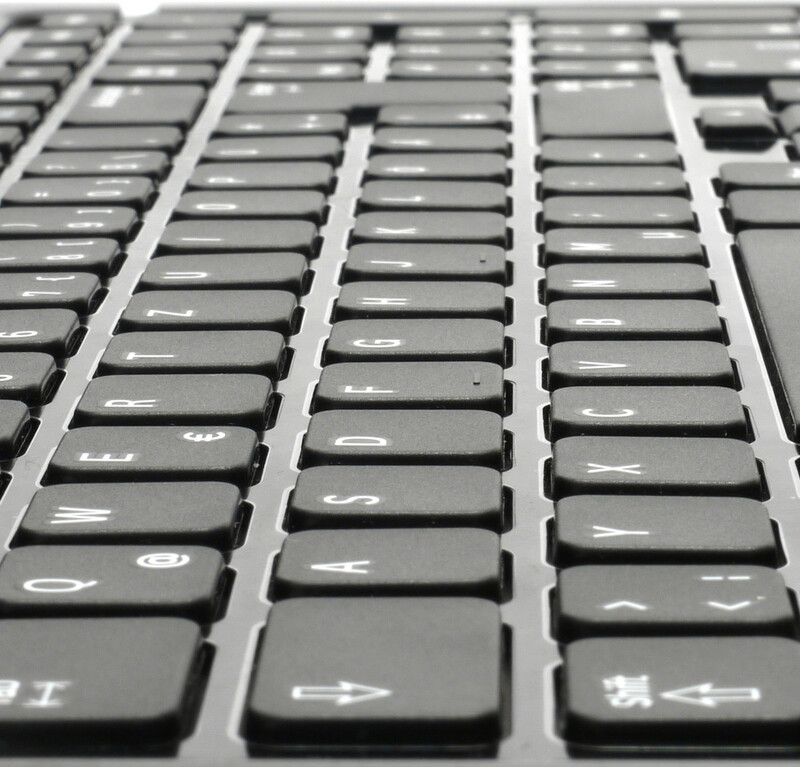 The keys have a medium keystroke length. Good performance for comparably little money and cool temperatures to boot. More contrast and brightness for the display and very importantly: no loss of brightness in battery mode. That the same panel delivers considerably better luminosity in the Samsung 355E7C.